For picking in late October and will store well until May. The large fruits are yellow with a red flush and the flesh is white and juicy. 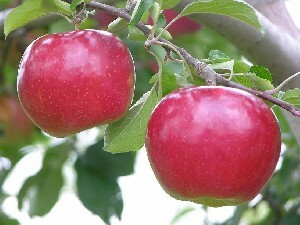 The flavour is good and the fruits have the advantage that they are very suitable for cooking as well as dessert. Pollinated by. Egremont Russet, Discovery, Cox Greensleeves, James Grieve, Irish Peach, Redsleeves etc. A first class eating variety that is one of the easiest for long term storing. Has resistance to Scab and is itself a good pollinator for other varieties.